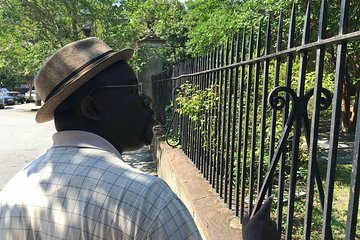 Get an inside perspective on Charleston's lesser-known black history during this 2-hour walking tour. Listen as your guide tells forgotten folktales and facts about important figures in the city's history. Meet your guide and tour group at the tour office at 9:30am. Set off through Charleston's historic neighborhoods on foot, taking in the local ambiance from the ground up. Listen as your guide combines historical facts, personal perspectives, and powerful storytelling. Stop by the Jehu Junes Hotel site, see Catfish Row, where the opera Porgy and Bess is set. Stroll along the ocean, through Waterfront Park and past the Charleston Harbor. Finish up with visits to the Heyward Washington House and the Old Slave Art Museum. After 2 hours, return to your starting point with a better understanding of Charleston's black history. This is a MUST do in Charleston. Damon Fordham is informative, entertaining and just amazing in his presentation of facts and the history of Charleston. So glad we did this as our first walking tour, sets the bar high. Highly recommend this and would walk with him again for sure. The tour guide was extremely knowledgeable and enthusiastic. My mom and I really enjoyed learning about history that is not typically covered in the classroom or in other history tours. I would highly recommend this tour to anyone visiting Charleston! This was a wonderful tour lead by and extremely knowledgeable historian who shared very interesting facts about Charleston that are not commonly known. I highly recommend taking this walk!